Alfie Ward was born on the 25th May 2002, he weighed 7lb 12.5oz. On the 27th May 2008 and the 15th October 2010 Alfie became a big brother to Bailey and Freddie, two young boys who love Alfie as much as he loves them. Alfie started life a happy and healthy little boy, that was, until he was diagnosed with Ganglineuroblastoma in September 2005 at the age of 3 years. Alfie was just starting nursery when this diagnosis came through. Doctors agreed to keep an eye on it through routine scans. Whilst dealing with this diagnosis, Alfie developed into a cheeky little chap, and became obsessed with football, Chelsea to be exact!! Unfortunately, at the end of 2007, during a routine MRI scan, doctors found another lump in Alfie’s abdomen and in January 2008 he was diagnosed with stage 4 high risk neuroblastoma. With Alfie due to become a big brother in May 2008 his parents feared the worst…that he would never meet his younger brother. Alfie began to miss school due to an operation to remove the lump and chemotherapy and radiotherapy appointments. Despite all this Alfie remained a happy little boy who always had a smile on his beautiful face. His school work and academic development never faltered. Alfie then began the road to recovery and started the remission step of neuroblastoma. He went back to school, enjoyed being back amongst his many friends and continued to develop into a handsome little boy. During another routine MRI scan in Dec 2011 the doctors found a query with the result. This t resulted in Alfie having more scans and tests. Although not diagnosed as a relapse of neuroblastoma, doctors decided Alfie needed to start intense chemotherapy to shrink the thickening area they found near Alfie’s spine and kidneys. Unfortunately chemotherapy didn’t shrink it enough but confirmed that it was Relapse of neuroblastoma. Alfie had his first lot of chemotherapy as an operation proved to be too complicated and risky due to the location of the area. They decided that their next option was MIBG therapy which done a good job of killing and shrinking the cancer cells. Next stage was cyber knife radiotherapy, stem cell harvest and another round of MIBG therapy. This all got Alfie into remission. Over the past 2 and half years Alfie has become a lovely teenager. In April Alfie complained of a backache, first of all we thought nothing of it but the gut instinct started to kick in. The Dr requested an X-ray, nothing showed up! The Marsden in Sutton arranged for an MRI scan from that minute I knew that this was it back. MRI results showed there was something new, next came an MIBG scan. The MIBG scan highlights neuroblastoma. 2 tumours showed up on his back, just to the left of his spine. A biopsy was needed to confirm. Biopsy came back neuroblastoma. Again our whole world has been turned upside down by this monster. Alfie has so far had 8 cycles of chemo, and a stem cell harvest. Alfie this week is due to start an oral chemo tablet to keep him stable while they organise his next step in his treatment. It’s been planned for him to have Mibg therapy in late march. He will be having 2 rounds of this treatment, it’s harsh but no where near as bad as the chemo. All I want is for my 15 year old boy to enjoy the rest of his life and try and get rid of this disease once and for all. Thank you so much for taking the time to read about my beautiful boy, anything you can do would be greatly appreciated. 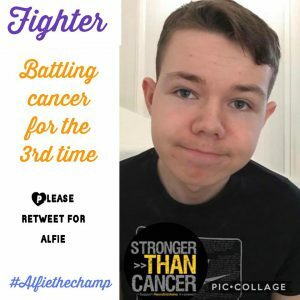 All cash donations are held by BLF in restricted funds for Alfie’s campaign. BLF will hold funds on behalf of Alfie and pay invoices directly.